Our pups sometimes have a way of sneaking up and surprising us, but few of our dogs actually trick us into thinking that they’re intruders in our homes. That’s what happened when one teenager in California stayed home alone with his dogs. The 18-year-old called police when his pups started barking and he heard noises in the house. When police arrived, the teen had locked himself in a room with his dogs, but it turns out he forgot about the biggest pup in his family. Officers heard scratching noises and shined their lights around the house. 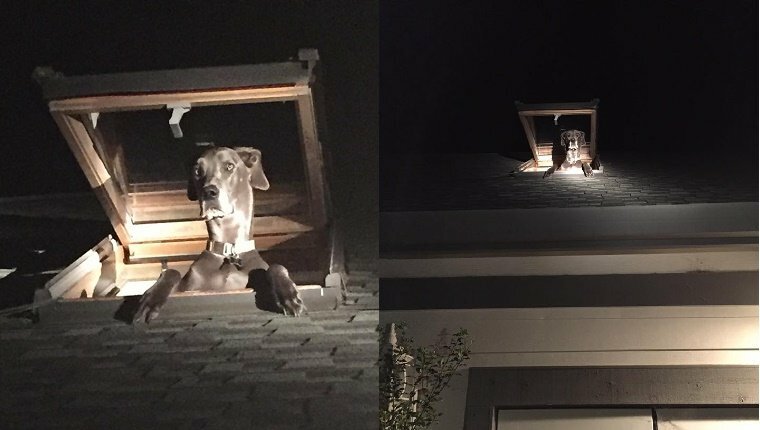 That’s when they saw a curious Great Dane popping his head out of a skylight window on the roof. It turns out, the Great Dane was the cause of the noise all along. The teen somehow just forgot that this big dog was around. After a good laugh and some funny pictures, the officers closed the case. It’s unusual to call the police on your own dog, but being home alone can get pretty scary sometimes. Has your dog ever scared you? Would your dog let you know if there were a real intruder in your home? Let us know in the comments below!